Click to read more about the book! Hot off the press! 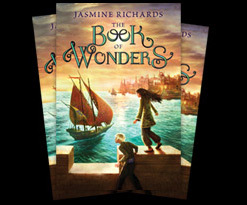 I’m so excited to announce that the Book of Wonders is out TODAY. It’s published by HarperCollins in the US and available in bookshops all around the US. For UK fans, you can get your copy online. Click on the image to the left to read a full description of the book and to find out where you can buy your copy or click here to view a sample chapter from the HarperCollins website. You can also view the awesome trailer over on YouTube. So, can YOU find the magic?